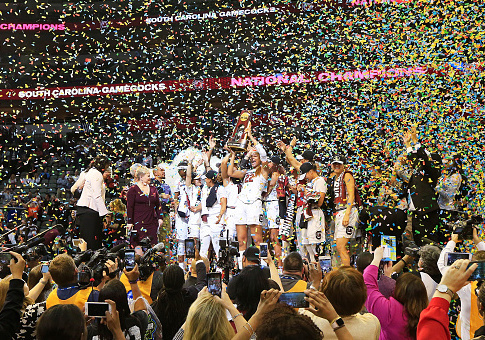 President Donald Trump is set to host collegiate sports championship teams in Washington, D.C. on Friday night, but the South Carolina women's basketball team has indicated that it will not participate. The Gamecocks coach, Dawn Staley, said on Thursday that her team has declined the invitation and will instead be focusing on its season ahead, ESPN reported. "We did hear from the White House about attending tomorrow’s event, but we will not be able to attend," Staley said in Thursday’s statement. "As I’ve been saying since our practices for the season started, all of our focus is on the season ahead. The only invitation we are thinking about is to the 2018 NCAA Tournament." National Collegiate Athletic Association (NCAA) teams will attend a reception at the executive mansion, however, the White House did not provide a list of the teams attending. After Thursday night’s 66-36 win over Clemson, the S.C. women’s basketball team is undefeated at 3-0. Staley led the Gamecocks to the school’s first national championship in April, and at the time, said the team would be going to visit the White House because "it’s what it stands for. It’s what national champions do." However, in September, Staley told the Associated Press the team had not received an invitation from the White House, "and that in itself speak volumes." She even said she was unsure if the Gamecocks would have accepted the invitation after "some things transpired over the last few months." Trump met with the 2016 NCAA football champion Clemson Tigers at the White House, but was unable to agree on a date to visit with the University of North Carolina’s 2017 national men’s basketball team earlier in the year. This entry was posted in Culture and tagged Basketball, Donald Trump, NCAA, South Carolina, White House. Bookmark the permalink.